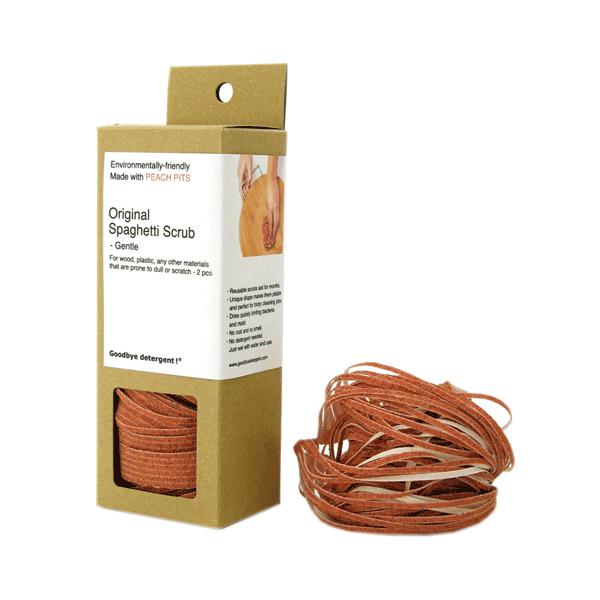 Spaghetti Scrub - Gentle features a natural abrasive made from peach pits (peach pit powder) on a cotton and polyester backing. No detergent is needed for general cleaning with a Spaghetti Scrub, but a tiny dab of soap can be used if tackling heavy grease. Please note: All Natural Original Spaghetti Scrub - Gentle sold as 2 pcs. All Natural Original Spaghetti Scrub - Gentle - Made with Peach Pit Powder, Cotton and Polyester. Each pad is made from sustainable and environmentally-friendly materials. Additionally, they're so durable and strong that each pad will save on cheaper scrubbers that would wear out, and is designed to work without detergents, which often contain harmful chemicals. General cleaning, removing stains from glass, wood, plastic, high quality nonstick pans, & any other surface prone to dull or scratch. Works without detergent, but you may use a dab of soap for tough jobs. Using the Coarse Spaghetti Scrub on high-quality nonstick pans may scratch surface.